Choose quarterly scheduled handyman and home maintenance services. We’ll bring our 14-point checklist designed to keep your home working properly. Just need a few things done? Call us for little fixes or special projects. We’re your on-call handyman, ready when you need us, or scheduled each quarter. Everything on our checklist starts with fire, life and safety—and adds in other important services to maintain the health and value of your home. Reasonable pricing and a friendly concierge make it easy for you to get the “honey do” list—and more—done. Hanging a picture, changing hard-to-reach light bulbs or adjusting the door that doesn’t close right—it’s frustrating when little things don’t get done. Our professional handyman will help with things you can’t do, or fixes that need to be handled before they become big repairs. Window washing, driveway cleaning, yard clean-up or even house washing are available. We can help install lighting inside and out or clean out HVAC ducts. Now you have one number to call when you want to get things done around your home. On our maintenance plan services happen each quarter, and you can always schedule additional services too. Here’s our 14-point checklist of professional handyman and home repair services. A more efficient refrigerator saves energy and money. Breathe easy knowing our ultra-sensitive detectors can find even the smallest gas leaks. Eliminate a major fire hazard, cut your drying time, save energy and the extend life of your dryer. Fix running toilets or random leaks and drips. Ask us about fixture replacements, too. Are your latches latching? Glass cracked or broken seals? Screens in good repair? We’ll take care of it all. Inspect landscaping for good separation and slope away from the house to avoid moisture inside. Check for plant/tree roots/growth against the house. Analyze fences and gates. Dry rot, plugged downspouts, improper caulking can all lead to expensive repairs. We’ll check for external trouble that could cause internal problems. ONE HOUR OF LABOR FOR HANDYMAN FIXES — per quarterly visit or 4 hours each year ($340 value!) Four hours every year to use on any Little Fixes. And we’ll provide complimentary estimates for Special Projects. The Quarterly Home Maintenance Program includes four hours of handyman services per year on the Little Fixes. After so many years in the home building business, we have proven, reliable contractors to help with nearly anything you can think of for your home. You won’t have to call a separate plumber, or roof expert or electrician. 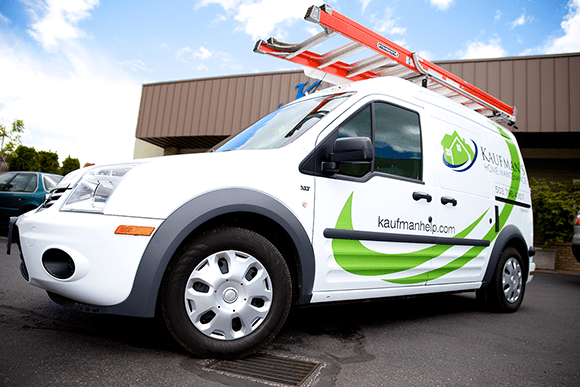 Just one call to Kaufman’s Home Maintenance will cover what you need. *Special Projects are estimated separately and not included in the Home Maintenance Program. When you’re on our Program, estimates for Special Projects are complimentary.